Maintaining your budget while in production is a stressful but necessary endeavor. In this post we’ll provide a free Film Budget Cashflow & PO Log template to help you actualize your film budget during production. What’s a PO Log, and why do we need it? 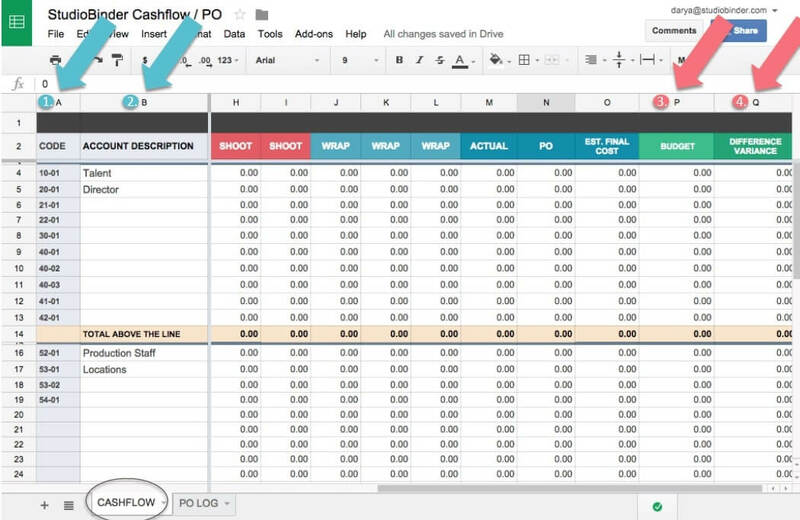 Download your FREE ​ film budget sheet template for tracking cashflow. The cashflow document is structured to allow tracking of expenses day by day. The rows represent accounts such as the cost of talent, crew, locations, etc. The columns represent the cost per day for those accounts. By default we breakdown the days by prep, shoot and wrap, though you are welcome to customize them any way you like (i.e. by departments, locations, etc). Film Cashflow document. Follow along below for an explanation. Add account numbers in this column. Number taxonomies are usually determined by your production accountant or the studio you’re working with. If your project is director/artist funded, account numbers can follow whatever standard the production prefers. Add a title or description of the account in Column B. If you have a budget total for this account, enter it here. If you don’t have a budget yet or program to create it, the cashflow document could be modified for this use. This is where we calculate what was spent vs. what was budgeted. This is a fast way to see what is remaining account-by-account, in real time. Money saved by account is positive (+) and money overspent is negative (-). Click on the cell you want to associate with a comment. Go to Insert > Comment > Type out your comment. You (and your team) can hover over the cell to view or edit the comment. 3. What’s a PO Log, and why do we need it? The PO Log (or “purchase order log”) is a document that tracks payment details on your production (i.e. who was paid, when, how, from what account and for what reason). Some entities may require their prior approval of a purchase order before any payments can go out. We separate our PO Logs into three sections so you can more easily track exactly what is spent to-date and identify what is due next. We also include a Voided section so you can confirm against payments or deposits returned. All Cash, Credit Card, Checks, and Wire Transfers should be recorded here as generated. You can list out Petty Cash amounts here so you can reconcile them later. This is where you list payments that are due at a future date so you can quickly create a list of upcoming payments for production approval or as a reference for cutting checks later. Any money returned, cancelled or credited back should be listed here. 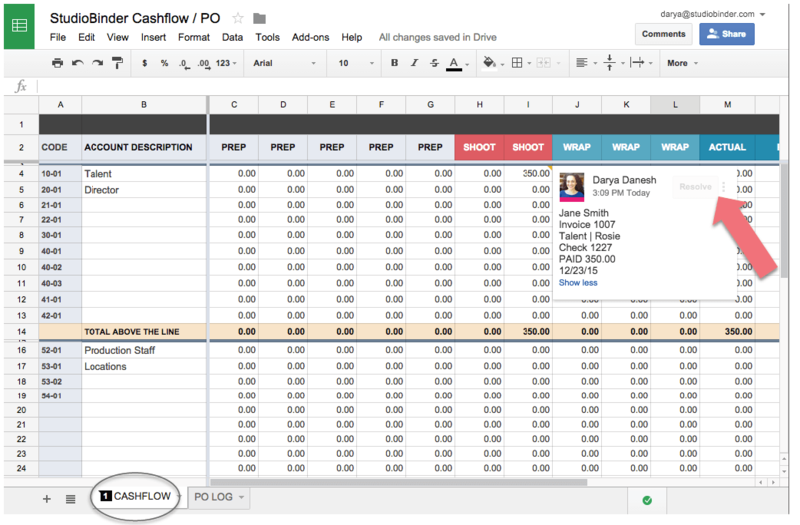 The Film Budget Cashflow and PO Log template helps you actualize your expenses during production shooting. Any suggestions or questions? Did we miss anything in our template? Let us know in the comments below! I’ve left my email a few times over the past weeks but I never received a follow up email asking to verify my address. We updated our page to make it easier for readers to download the template to their Google Drive. Just click the link below, and on the Google Sheets page, click File > Make a Copy to save it to your Google Drive. Cheers! 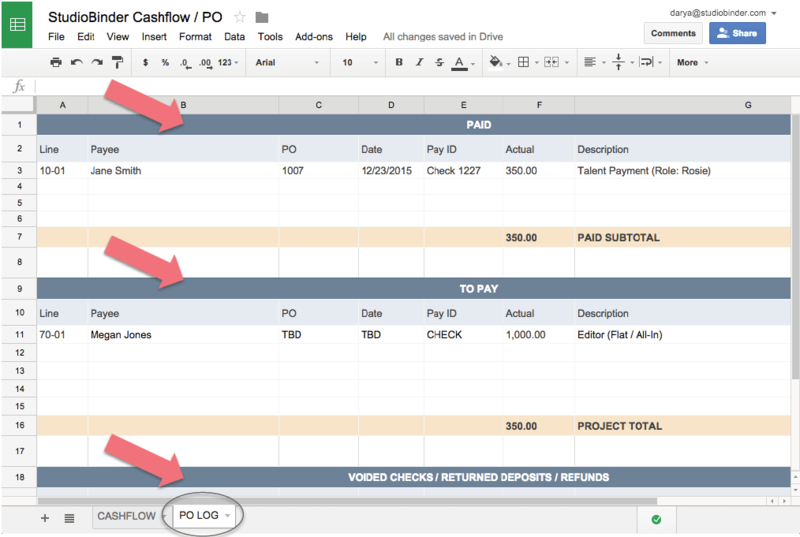 What do we input into the “Wrap” column in the Cash Flow section? You can rename those columns if you like, but if you leave them as “Wrap” then you would put there any costs incurred for that department after wrap. Hope that helps! Quid with the link to receipts & invoices? You mention PO & PO log, is that possible with different people?